by Richard Reising. Baker Books, 2006. Church marketing professional Richard Reising’s premise is that “Marketing is part of the infrastructure” of the church, saying “it is the steel beams that hold up the walls.” Reising defines marketing not as manipulation, but as “communications or connecting with people". 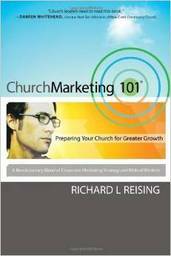 Reising’s broad view of the church and church marketing undergird this comprehensive, practical, and biblically centered book. Reising identifies how and what a church communicates to insiders and outsiders, asks what the church wants to communicate, and highlights inadvertent messages the church sends. Examples from the lives of Jesus, Paul, and other biblical characters are sprinkled throughout the book. This Protestant resource is packed with stories and practical examples. Reising explains how church communication and marketing errors eventually become obstacles to church growth. He contends that “When you do not cut the grass, you’re marketing.” He asks, “How can we reach those outside the church walls if we do not spend time with them?” Chapter topics include perceptions, “target markets,” “fundamentals of growth,” branding, and church vision. Each chapter concludes with assessment questions that are designed to help congregations engage in “moving forward.” Many of Reising’s ideas can be implemented by a variety of faith traditions.